There so many ways to help others. I tend to gravitate to causes for children. 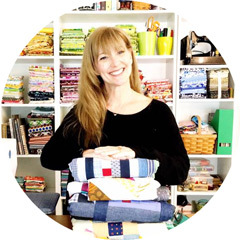 100 Quilts for Kids is one way I can help and I was recently contacted by my friend Teresa to let me know she is writing a book...WHAT!?!?! It is about her life, her adventure and her LOVES...there happen to be A LOT of them and they are in Vietnam and they happen to be orphans. She asked if I would be willing to help spread the word of her fundraiser and the answer was YES!!!!!! Pho for Three is where you can go to find out more about this wonderful woman and the children she loves. 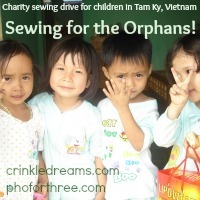 "As part of our Pho for Three fundraiser, I’m heading up a charity sewing drive to get quality, handmade items to these kids I love so much. There are five things, in particular, that I’m asking for: shorts, dresses, messenger bags, pencil pouches and simple diapers. Depending on your time, sewing abilities, spare fabric, etc. you can pick whichever one you want to make. With more than 100 kids ranging from newborn to 17 years old, there’s plenty of leeway." If you cannot donate to the fundraiser, please consider the sewn items for the children you can donate!!! The need is great and we can all make a difference. I realized I had a lot of flannel in my stash that I was not using and asked Teresa if receiving blankets were needed? She said yes, that the babies are often just laid on blankets for most of the day. These are the blankets I made so far. They are double sided flannel, serged 30in sq. I will making more before Sept 30th!!!!! As an added incentive...Figgy's is giving a 15% discount to anyone who donates items or money!!!!!! Thank you so much for any and all support you can give to these beautiful children!!!!!! I'm definitely checking this out. Vietnam is very close to my heart as that is where my son was born. Thanks for the heads up.